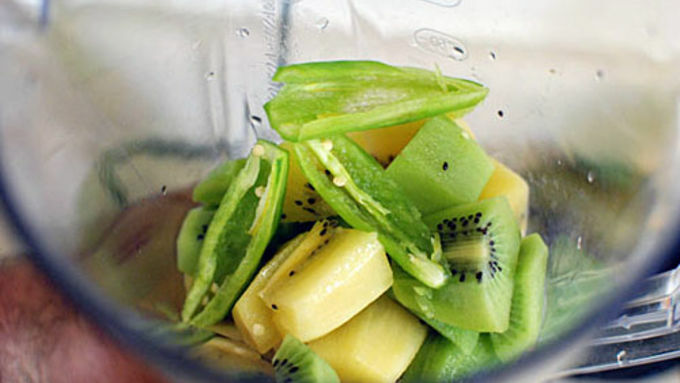 In a blender, mix the peeled kiwi, peeled and seeded jalapeño, and coconut water. 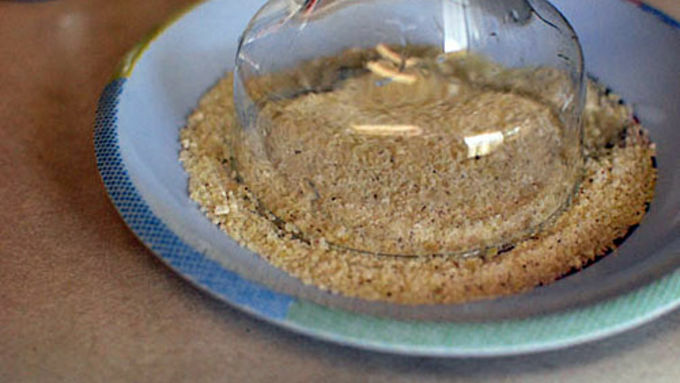 In a spice grinder, grind candied kiwi with sugar to form a powder. In a shaker filled with ice, mix 1.5 oz vodka with 4.5 oz kiwi mixture and shake well. Rim glass with powdered candied kiwi, fill with ice, and pour in the drink. Enjoy! I tend to frequent ethnic markets because of all the exotic food I cook. Every time I pass the fresh fruits and veggies I want to try all the colorful and oddly shaped produce, but I never know what to cook with them. Finally, I said “enough is enough” and just bought every weird fruit I could find! I decided to try making a few different cocktails with some friends so we could see how each fruit tasted on its own, but also what it would pair best with. The two best drinks we made that afternoon were an Orange Dragonfruit Cocktail and a Kiwi Jalapeno Cocktail. Some of the fruit is interesting to cut into! The inside of a dragonfruit was very unexpected and cool looking. A little orange and honey brought out the sweet and tangy flavors in the dragonfruit. Shaken with vodka and served over ice. For the next drink kiwi was the main flavor, so to enhance the kiwi we decided to rim the glass with kiwi sugar. Just grind up some candied kiwi with a little extra sugar. I was able to find two different types of kiwi – the regular supermarket kind and a golden variety – so we used both in this drink. A little jalapeno adds an interesting dimension to this drink. Blend this up with coconut water. Coconut water is the new hip drink of the moment, and in this drink it adds a subtle creaminess without covering up the kiwi flavor. Some lemon juice on the rim of the cup helps the sugar stick. 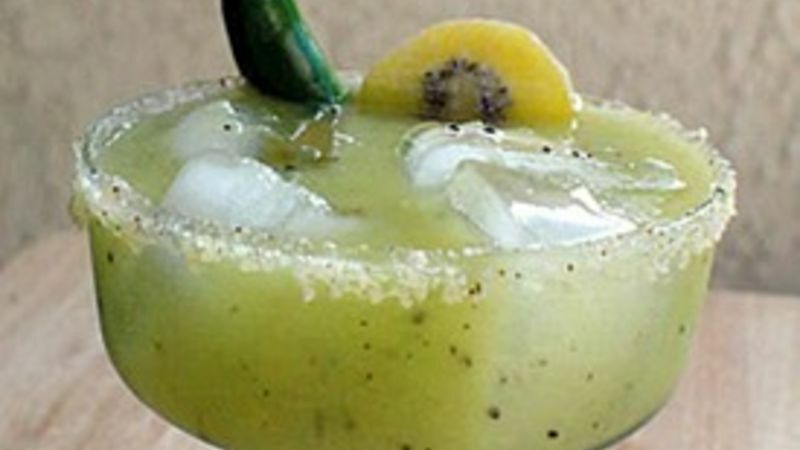 One jalapeno and a piece of candied kiwi help people know what to expect in the drink. We tried a few other drinks that day with the horned melon and papaya that didn’t turn out very good. But it was a lot of fun sitting around with friends on a sunny afternoon tasting drinks and experimenting with different flavors!